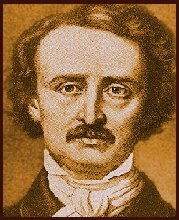 Edgar Allan Poe, considered a spiritual brother by Charles Baudelaire, was of course a well-known poet, a storyteller who invented the detective story, and a critic whose Poetic Principle, while considered naive even at its first publication, is still much examined for Poe's conceptions. His fine and well-educated ear helped him contrive a poetry of wonderfully evocative and complicated rhythms, using much repetition of sounds in assonance, consonance and rhyme, of which "Ulalume," written in about 1844, is a fine example. In the ghoul - haunted woodland of Weir. Nor the ghoul - haunted woodland of Weir. Oh, hasten! - oh, let us not linger! See! - it flickers up the sky through the night! find the widest field for the Poetic development."